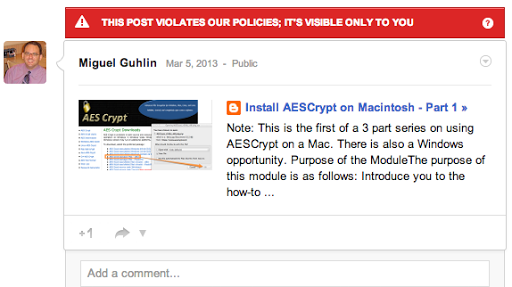 Update: The warnings have been removed from my Google Plus postings, but I’m still curious what triggered the policy violation. Anyways, thanks, Google+ folks! Of course, I’m submitting these all for review but I can’t help but wonder…why, Google, why? Why can’t other people see my post? 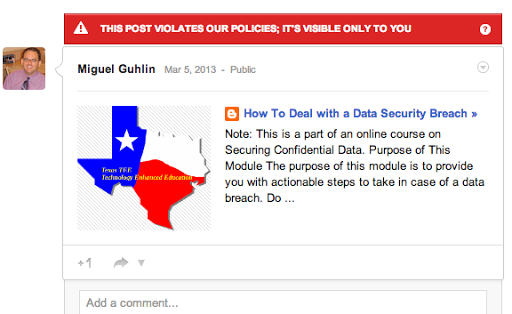 The content in this post violates the Google+ User Content and Conduct Policy. Posts that contain spam, such as unwanted promotional or commercial content, or unwanted or mass solicitations, are not appropriate on Google+. Offensive or repetitive posts are not appropriate either. If you think we’ve made a mistake about your post, please submit this post for review. 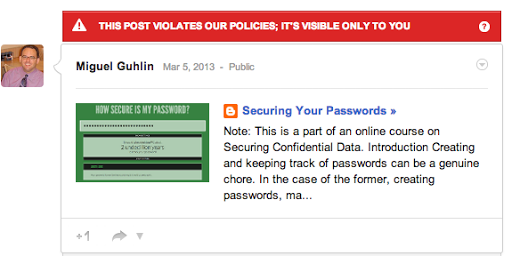 If our review determines this post does conform to our policies, we’ll make it visible to others again. Otherwise, this post will stay visible only to you, and we will delete it in a few weeks. Note: This is a part of an online course on Securing Confidential Data. Did you know that if data is encrypted and a data breach occurs, you are not obligated to report it? This is the power of data encryption and can potentially spare the District from unnecessary litigation and expense. This is known as an encryption safe harbor. Texas defines a data breach in terms of sensitive personal information only if the data items are not encrypted (Source: Data Breach Charts, Baker-Hostetler). Sec. 521.053. NOTIFICATION REQUIRED FOLLOWING BREACH OF SECURITY OF COMPUTERIZED DATA. (a) In this section, “breach of system security” means unauthorized acquisition of computerized data that compromises the security, confidentiality, or integrity of sensitive personal information maintained by a person, including data that is encrypted if the person accessing the data has the key required to decrypt the data. In this online course, you will have the opportunity to learn how to encrypt/decrypt confidential data files and share them with others. In this online course, you will learn how to quickly encrypt files with a secure password, as well as how to decrypt the password. The process is fairly straightforward and easy. 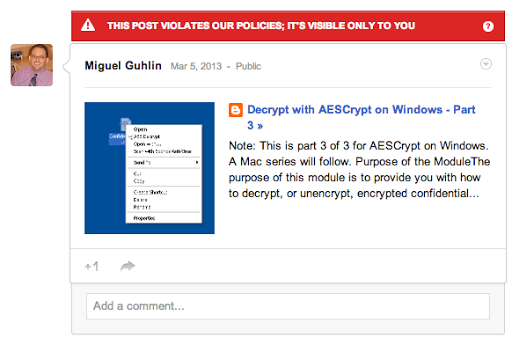 To accomplish encryption, you will learn how to use AESCrypt, a free open source software program. AES Crypt–which uses a powerful 256-bit encryption algorithm–is a file encryption software available on several operating systems that uses the industry standard Advanced Encryption Standard (AES) to easily and securely encrypt files. What does encrypted data look like?Below, you will find two examples of data. The first is what data looks like when you send it unencrypted over the Internet, or leave it unencrypted on your computer. The main benefit of unencrypted data is that you can open that document immediately and get to work. The main drawback–and in many cases when that data is compromised, a public relations fiasco for the organization–is that anyone else can open that document and view its contents. Putting a simple Word or Excel password is insufficient since software tools abound that can “lockpick” and ascertain the passwords or remove it. That’s why a stronger solution like AESCrypt is needed. Which would you rather an identity thief, or unauthorized person, have access to? If you are like most folks, you will want the encrypted version. AES Crypt is the perfect tool for anyone who carries sensitive information with them while traveling, uploads sensitive files to servers on the Internet, or wishes to protect sensitive information from being stolen from the home or office. AES Crypt is also the perfect solution for those who wish to backup information and store that data in a cloud-based storage service (e.g. Dropbox, GoogleDrive), and any place where sensitive files might be accessible by someone else. What happens to my original file when I encrypt it? Another safety feature built-into AES Crypt is that if you have an encrypted file already with the exact same filename, it will not over-write the previously created file. 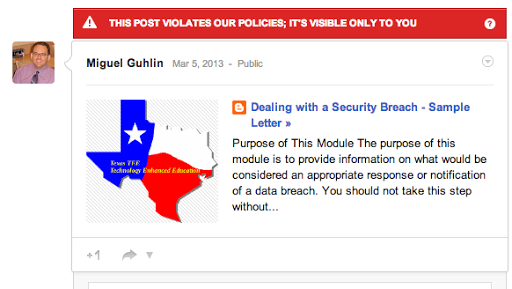 Note: This is part of a Securing Confidential Data online course. Be a Responsible Digital CitizenDid you know that students in Grades 6-8, and by extension all educators in Texas, are expected to practice safe and appropriate online behavior, personal security guidelines, digital identity, digital etiquette, and acceptable use of technology; and understand the negative impact of inappropriate technology use, including online bullying and harassment, hacking, intentional virus setting, invasion of privacy, and piracy such as software, music, video, and other media (Source: TEKS Chapter 126; 5 C-D)? Personal security guidelines, preventing hacking are key aspects of digital citizenship and are addressed by learning how to better safeguard confidential data. 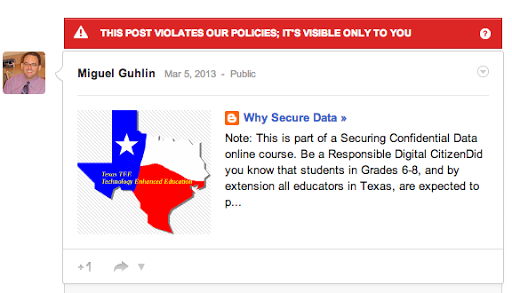 Doing so can prevent data security breaches that can be embarrassing to school Districts. A data security breach occurs any time there is unauthorized access to school district data, including FERPA data. Lost laptops are the main cause of data breaches. To accomplish this, you need to secure, not only physical copies of the data (e.g. print-outs in locked file cabinets) but also encrypt digital copies of that data. Direct costs are incurred by school districts for having to notify individuals whose confidential data has been compromised, as well as notify credit agencies. The cost of paying for credit protection for individuals affected. The school district may suffer damage to reputation. Staff may be disciplined or terminated depending on the severity of the data breach. Statistics show that as many as one in ten laptops will be stolen or lost from an organization over the lifetime of each computer. 86% of security practitioners report that someone in their organization has had a laptop lost or stolen. 56% report that it resulted in a data breach. Encryption of data stops cyber criminals from stealing data on laptops. Ninety-seven percent of stolen computers are NEVER recovered. That means that confidential data could be out there indefinitely, waiting like a time-bomb to explode until someone discovers it and then uses it. San Antonio, Tx Large Urban District: An April 19 car burglary resulted in the exposure of student information. An external hard drive containing letters associated with students who applied to the [name of campus removed] was stolen from a teacher’s car. The letters contained applicant names, Social Security numbers, dates of birth, home addresses, phone numbers, and previous school district information. Texas School District: The District discovered that a number of employees had their names, Social Security numbers, disability plan information, and salary information available on a publicly accessible website. Employees who were enrolled for disability insurance had their information posted in April 2011 on the Employee Benefits/Risk Management website. Texas School District: Two students may face criminal charges for hacking into the School District’s network server and accessing a file with 14,500 student names and Social Security numbers. The students are a high school junior and a senior. Students who attended during the 2008-2009 school year may have been affected. Texas School District: Hackers accessed a District server and were able to collect the personal information of students, teachers and other employees. There were names, Social Security numbers, and addresses from approximately 63,000 students and 9,000 teachers on the district’s internal network (myepisd.org). The District was not aware of the breach until a computer security company noticed hackers bragging about breaking into the District’s system. Names, ethnicity codes, and student ID numbers for 26 students were posted by hackers. Texas School District: Between August 2010 and January 2011, CDs that were mailed to the Texas Education Agency (TEA) were lost. The CDs were unencrypted and contained student Social Security numbers, dates of birth and ethnicity. The CDs were sent to TEA so that identifying information could be removed and the information could be passed along to the University of Texas at Dallas Education Research Center. According to a TEA spokesperson, the ISD’s data set is missing from a set of other district information that was sent. Though the TEA claims that only Laredo student information was exposed, the information of 164,406 students from eight Texas school districts was sent. The information on the unencrypted disks goes back 20 years. This information includes current and former students in the top 10% of their class who graduated between 1992-2010 from [various] school districts. Texas University: Alumni who graduated before 1985 and requested copies of their transcripts may have been affected by a breach involving accidental disclosure. Certain alumni had their names, Social Security numbers, addresses, and telephone numbers in an electronic file that was emailed to an individual who would not normally have access to such information. The person who received the email notified the organization. Texas Law School: An administrative error resulted in recently admitted students receiving an email with the information of all recently admitted students. Student names, addresses, grades, LSAT scores, race, scholarship amount, and other types of personal information were available in the email attachment. No Social Security numbers or dates of birth were in the emailed spreadsheet. Students were encouraged to treat the data with the confidentiality of a lawyer and immediately delete the email. What could have been done differently in each of these cases? Encryption of the data being transmitted via email, or stored on a computer, USB flash drive or web site. Encrypting the confidential data is the single-most important step that could have been taken. Name, address and birth date. This information can be used in combination with other data to impersonate you. Documents with social security numbers in them. Documents with credit card numbers, bank account information, etc. Any information that might be considered confidential. This can be your spouse or child’s medical information, house insurance, etc. Names such nicknames, maiden name, mother’s maiden name, or alias. Personal identification numbers, such as social security numbers, passport number, driver’s license number, taxpayer identification number, financial account or credit card number. Home mailing address information, such as street address or personal email address. Your years of marriage, the name of your spouse and/or children, as well as relatives. Date of birth, place of birth, race, religion, weight, activities, geographical indicators, medical information, financial information. Do not post the information for any individual staff member—or student as defined in the Family Educational Rights and Privacy Act (FERPA)–on the Web, send it via email, store it on portable media (including laptops, USB flash drives, mobile phones) unless it is unavoidable and the data is encrypted. The purpose of this module is to provide information on what would be considered an appropriate response or notification of a data breach. You should not take this step without notifying your supervisor first and receiving his/her go-ahead. This information is provided as a sample of what may be done or could be done in the event of a data security breach. A laptop computer in the ORGANIZATION NAME, which contained personal information for POPULATION AFFECTED, was stolen on DATE. You are receiving this notification because your name, LIST SPECIFIC INFORMATION COMPROMISED HERE were included in the stolen personal information. The laptop held confidential information. A vehicle was broken into by unknown parties and stolen. It is believed that the perpetrator(s) was targeting the laptop computer, not the personal information it contained. The stolen computer contained information on POPULATION, including their CONFIDENTIAL INFORMATION. The confidential data files were not encrypted at the time of the theft, thus allowing unauthorized use of this data. At present, we are not aware of any misuse of information but will update you on developments in the case they occur. We were advised that there was a reasonable probability that the crime would be solved quickly and the information recovered. However, we want to make you aware of the potential consequences. To that end, we are taking steps to prevent future incidents of this type. 1. A web site has been developed to give you online access to information at http:// . 2. Require full encryption of all personal information stored on departmental computer systems. We will also require all ORGANIZATIONS to review personal data stored on computer equipment and to remove all unessential data. 3. Conduct an immediate internal audit of how the department handles all personal information. This audit will examine the security of the systems, the policies and practices regarding access and use of such information, and the policies for ensuring that such data are gathered and/or retained only when imperative. We will also examine all procedures for processing data outside the ORGANIZATION. Should you have any questions or concerns, please do not hesitate to make contact via email or phone at ###-####. The purpose of this module is to provide you with actionable steps to take in case of a data breach. Do not take action unless you have first notified your supervisor and other critical district personnel. Move quickly to assess what information has actually been compromised or has the potential to have been compromised. If the data was encrypted, you’re under no obligation to divulge that it was “stolen.” However, if the information is unencrypted–in a spreadsheet or a text file–then you must proceed to step 2.
a) Notify the Federal Trade Commission at (877) 438-4338(http://www.consumer.gov/idtheft/) regarding the possibility of identity theft. Phone option #3 provides specific advice on what to do next. b) Place a Fraud Alert: Contact one of the three major credit reporting agencies to complete an automated phone-in fraud alert process. When individuals place a free, seven year fraud alert, that agency will notify the other two agencies. Fraud alerts will then be placed automatically on the individual’s accounts at all three agencies. Contact information for the credit agencies: Equifax (800) 525-6285; www.equifax.comExperian (888) 397-3742; www.experian.com (fraud alert process available online) TransUnion (800) 680-7289; www.transunion.com Once individuals receive their credit reports, they should review them for suspicious activity. If individuals see any accounts they did not open or incorrect personal information, contact the credit agency(s) or the individual’s local law enforcement agency (e.g. city police department) to file a report of identity theft. c) Call the U.S. Social Security Administration at (800) 772-1213.
d) Password protect your bank accounts. Work with your bank to have them require the use of a password before any transactions–including withdrawals or deposits–can be made. Establish a clear line of communication with those affected through a web site, via email, snail mail, AND by phone. Leave no stone unturned in making folks aware. Make contact in multiple forms several different times. Surprisingly, some people believe that “It just couldn’t have happened to me!” It’s your job to make sure they understand the consequences of inaction. Communicate, communicate, communicate. If you’re on the receiving end of angry phone calls for your organization, be sure to acknowledge that it’s the organization’s fault, accept responsibility (since you are representing the organization) and listen to what they have to say. Explain exactly what they need to do to address the issue, and what you’re doing to help…but the most important thing you can do is listen to what they have to say. Communicate in this case means listening and responding, understanding their frustration is definitely legitimate. Schedule several face to face meetings with the folks affected, and offer to cover the cost of the more detailed options available through the credit agencies. Although the credit agencies offer “free” option–although they’ll try to get you to pay–if your organization was responsible, then they should be expected to pay for a few months, especially if there is proof that the compromised data has been used. Creating and keeping track of passwords can be a genuine chore. In the case of the former, creating passwords, many do not know how to create passwords that are secure. In the case of the latter, keeping track of passwords, a secure password is often difficult to remember. This short overview will provide you with some tips and tricks for both creating and keeping track of passwords. Yet, you can easily create a password that is unique every time if you take advantage of a Secure Password Generator program, and then add your own spin on it! The secret to a good password, some say, is it’s length and randomness. I encourage you to pick your toughest password, the one you’re sure no one would be able to crack, and drop it into a web site like How Secure is My Password? that will actually tell you. For example, one of my favorite approaches is to use book titles from literature. For example, To Kill a Mockingbird plus some numbers and special characters. Two undecillion years! But now that I have a secure password that would take years to crack, or for people to guess, how do I keep track of it? If you don’t think you can remember all these passwords, use Keepassx–which you can put on Dropbox.com and access them from your phone–to store your passwords. That way, you can easily keep track of all your top-secret passwords and not have them written down on post-it notes or have them taped to your desk. Keepassx is easy to use encrypted database that works on Mac, Windows, Linux, iOS (e.g. iPad/iTouch), and Android devices. Note: This is part 3 of 3 of a series on using AESCrypt to protect confidential files on your Macintosh computer. There is also a Windows specific series. 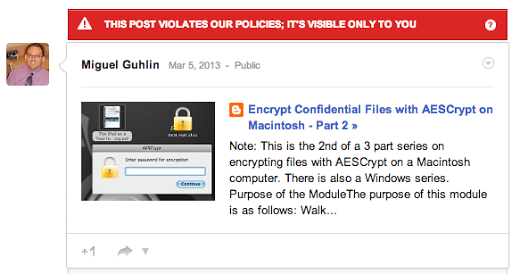 Purpose of the ModuleHave you received an encrypted file via email and need to decrypt it for use? The purpose of this module is to help you decrypt, or unencrypt, encrypted confidential files. Step 1: Drag the file(s) to be decrypted on top of the AESCrypt app alias on your Desktop. You’ll be prompted for the secret password. Step 2: Repeat the process with multiple encrypted files. That’s pretty much all there is to Decrypting files! If you are going to make changes to the unencrypted documents, you’ll want to discard the original encrypted documents. Then, after changes are made, encrypt your modified documents and send them or store them in encrypted format. To securely remove confidential files that may have been moved to the Trash but still reside in “ghost” format on your computer’s hard drive, make sure to take advantage of the SECURE EMPTY TRASH feature on your Mac computer. Watch this short video on how to securely empty your trash. Note: This is the 2nd of a 3 part series on encrypting files with AESCrypt on a Macintosh computer. There is also a Windows series. Walk you through the how-to of using AESCrypt on your Macintosh computer to encrypt confidential data in multiple formats, such as MS Word or MS Excel. 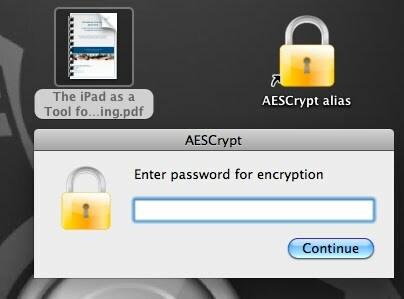 Step 1: Drag the file(s) to encrypt on top of the AESCrypt application/shortcut (I put it on my desktop for easy access). Type in your ultra-secret password. Step 2: AESCrypt encrypts your file and then you can copy it to a USB flash drive (gasp) or email it without fear someone will be able to decrypt it (unless you used a simple, easy to guess password…use a secure password generator and never email the password to the other person since that’s like writing it on a postcard; call them instead). Note that this encrypted file can be decrypted on Windows, Mac or Linux computers provided the other person has AESCrypt installed and knows the password. This makes AESCrypt the perfect encryption tool for school administrators who need to email confidential data via GoogleApps for Education. Practice OpportunityChoose a file you’ve saved from GoogleDocs or a Microsoft Excel file on your computer. Don’t worry, your original file will not be harmed. 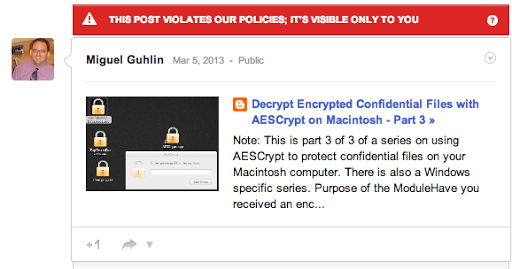 Note: This is the first of a 3 part series on using AESCrypt on a Mac. There is also a Windows opportunity. Introduce you to the how-to of installing AESCrypt on your Macintosh computer so that you can encrypt confidential data. Should you need assistance in installing AESCrypt on a District computer, please do not hesitate to submit a HelpDesk request via Eduphoria. Step by Step: Get a copy of AESCrypt for Macintosh and save it on your computer. a) Click this link and save a copy of the zipped (compressed) installation file. Don’t worry about the zip file format since your Mac will know what to do with it once you save it. b) Double-click the saved installation file, named AESCrypt_v308a_x86.pkg.zip. c) Look for the AESCrypt file you have just saved to your Desktop or Download folder, then double-click on it. It will look like the one shown below. When you uncompress it (a.k.a. unzip), you will have the AESCrypt_x86.pkg file. Double-click to begin installation. Begin and finish the installation program, clicking CONTINUE when appropriate. When the process is complete–and you will only have to complete this step once per computer–you are ready to begin encrypting content. Note: This is part 3 of 3 for AESCrypt on Windows. A Mac series will follow. Purpose of the ModuleThe purpose of this module is to provide you with how to decrypt, or unencrypt, encrypted confidential data files using AES Crypt on Windows computers. View How to Decrypt Confidential Files using AESCrypt on a Windows computer. Step 3 – Note that your un-encrypted, or decrypted, file has a different icon. 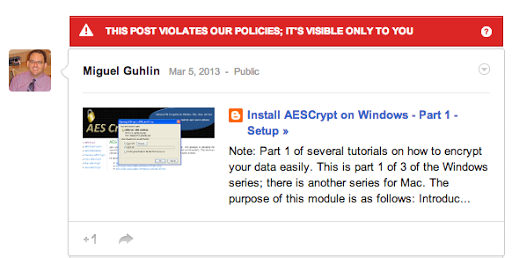 Note: This is part 2 of 3 on encrypting files using AESCrypt on a Windows computer. There will also be a Mac series. Purpose of the ModuleThe purpose of this module is to provide you with how to encrypt confidential data files using AES Crypt on Windows computers. View How to Encrypt Confidential Files using AESCrypt on a Windows computer. Step 3 – Note that your encrypted file has a different icon. When you “delete” a file — for instance, by putting the file in your computer’s trash folder and emptying the trash — you may think you’ve deleted that file. But you really haven’t. Instead, the computer has just made the file invisible to the user, and marked the part of the disk drive that it is stored on as “empty,” meaning that it can be overwritten with new data. But it may be weeks, months, or even years before that data is overwritten, and the computer forensics experts can often even retrieve data that has been overwritten by newer files. Indeed, computers normally don’t “delete” data; they just allow it to be overwritten over time, and overwritten again. The best way to keep those “deleted” files hidden, then, is to make sure they get overwritten immediately. Eraser is a free/open source secure deletion tool for Windows, and is much more sophisticated than the built in cipher.exe. It can be used to quickly and easily target individual files for secure deletion, or to implement periodic secure deletion policies. You can get a copy of Eraser here and some tips on how to use it here. Watch this video tutorial on how to install and use Eraser on your Windows computer. 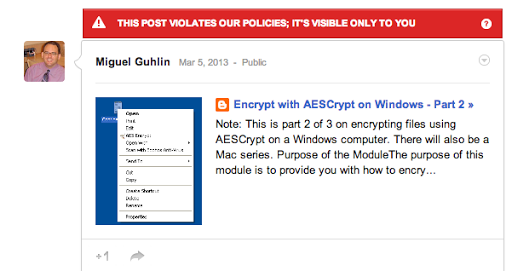 Note: Part 1 of several tutorials on how to encrypt your data easily. This is part 1 of 3 of the Windows series; there is another series for Mac. Introduce you to the how-to of installing AESCrypt on your Windows computer so that you can encrypt confidential data. If installing on a Windows XP computer, you can use the step by step below. Step by Step: Get a copy of AESCrypt for Windows and save it on your computer. Step 1: Getting a copy of the AESCrypt setup program. a) Click this link and save a copy of the zipped (compressed) installation file (this is the 32-bit version which will work on WinXP; if you are using Windows Vista or Windows 7, you will need the 64-bit version). Click OK to save the zipped file onto your computer. Once you have completed the steps illustrated above, you are ready to install the program. b) Once the installation starts, click NEXT until you get to the INSTALLATION COMPLETE stage, as shown below.